The article below is taken from the Wikipedia entry about St Robert of Knaresborough. Further information can also be found on the Knaresborough Anglicans website here. He was born Robert Flower (Floure or Fleur), the son of Touk Flower, mayor of York, in York in 1160. Very early in his life he became a sub-deacon and a novice at the Cistercian abbey of Newminster, but he only stayed there a few months. Seeking a life of solitude, he visited a knight/hermit who lived by the river Nidd at Knaresborough. At first he had to share his cave with a knight who was hiding from Richard 1, on the death of the king the knight returned home to his family leaving Robert on his own. The cave had a small chapel dedicated to St. Giles built around it. He continued to live there for some years, until a wealthy widow, Juliana, offered him a cell at St. Hilda's Chapel in Rudfarlington, near by. There he developed a reputation as a wise and holy man who cared for the poor. He stayed there just a year before his hermitage was destroyed by bandits. Robert dispossessed of his home lived, for a time under the church wall at Spofforth and then he tried living with the monks at Hedley, near Tadcaster, but he found them far too easy going for his style of life. By this time the area had calmed down and he returned to Rudfarlington. For a time Robert prospered, having four servants and keeping cattle. But he was soon in trouble again this time with William de Stuteville, the constable of Knaresborough castle who accused him of harbouring thieves and outlaws. Robert was well known for his charity to the poor and destitute. His favorite form of charity was to redeem men from prison. 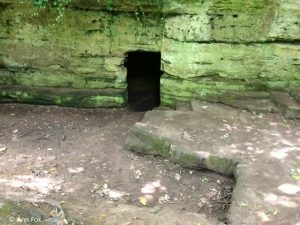 Having his hermitage destroyed for the second time, this time by the forces of law and order under William de Stuteville, Robert returned to the cave at Knaresborough, where he stayed for the rest of his life. Although living as a recluse, his piety soon attracted followers and gifts from local benefactors which included land alongside the river. A number of stories of St. Robert exist both in Latin and Early English verse. One concerns his complaining about the King’s deer eating his crops. Sir William, making fun of the saint, invites Robert to catch the offending beasts. Robert not only manages to herd the deer into his barn as if they were a tame flock of sheep, but also harnesses them to his plough and sets them to work. Robert died on 24 September 1218. Before his death St Robert established an order of Trinitarian Friars at Knaresborough Priory, but he warned them that when his time came the monks of Fountains abbey would try to carry his body away to their own establishment, he urged his followers to resist them, which they did and so St Robert was buried in his chapel cut from the steep rocky crags by the river, where it was said that a medicinal oil flowed from his tomb and pilgrims came from near and far to be healed by this. He lived in various places in the vicinity of Knaresborough before taking up residence in a cave by the river Nidd (then known as St. Giles' Priory). It is said that King John visited him and Trinitarian friars also venerated him. Towards the end of his life, pilgrims flocked to see Robert to seek spiritual guidance and to be healed of physical ailments. His brother Walter, then Mayor of York, came and paid for some new buildings, including a chapel dedicated to the Holy Cross. The floor plan of this can still be seen alongside Robert’s cave in Knaresborough today. St. Robert's Cave is situated between Abbey Road and the River Nidd (53.999421,-1.451212). There is a path from the road down to the cave and ruins of the chapel. A sign shows the site layoutand a brief history. Images of St Robert's cave can be found here. Michael Calvert's History of Knaresborough (1844) describes St Robert's Well as being near the York Road, about 1 mile from the town. Calvert also relates that prior to 1791 it had been an open well about two feet deep but at that date bathing facilities were built at the well, because of its value as a cold bath. An 1850s OS map reveals a place marked as "Cold Bath" near the York Road, just as described by Calvert, and this site was connected by a track to St Robert's cave and chapel 400m to the south-west. The Monkswell business park was built on the site of St Robert's well/Cold Bath where a well shaft preserves the site of the spring which fed St Robert's Well and the Cold Bath. Visitors drop coins (as well as litter) through the metal grid that covers the wellshaft. St. Robert's feast day is 24 September. Seven stained-glass panels of his life, originally from Dale Abbey survive at St. Matthew's Church in Morley, Derbyshire. Today the cave, carved into a limestone cliff, can still be visited by the public. A small chapel and evidence of a small living area are all that remain. Churches are dedicated to St. Robert at Knaresborough in North Yorkshire, and at Pannal, Harrogate. Retrieved from "https://en.wikipedia.org/w/index.php?title=Robert_of_Knaresborough&oldid=735256247" and used under https://creativecommons.org/licenses/by-sa/3.0/.